Cosmologist Ethan Siegel seems to enjoy serving as a kind of ideological stickler. Call him Ethan the Enforcer. Siegel fervently wants you to conform to whatever speculative dogmas are popular among his fellow cosmologists, whether it be the theory of dark matter or Guth's theory of a short burst of cosmic inflation at the dawn of time. Showing great overconfidence (like many of his fellow scientists), Siegel often speaks as if the cases for such speculations are slam-dunks, even though there is no strong case for either of these speculations. The things typically claimed as evidence for dark matter are mainly just things suggesting “something else,” some unknown reality, rather than dark matter specifically. Sometimes Siegel writes kind of “whip the heretics” posts such as his recent post “There's A Debate Raging Over Whether Dark Matter Is Real, But One Side Is Cheating.” Siegel's purpose in this post is to demand compliance and conformity in regard to the speculative dogma of dark matter. He attempts to verbally flog those who prefer alternative theories, such as the theory of MOND (Modified Newtonian Dynamics), accusing such people of “cheating.” But he does nothing to substantiate such a claim. Rather than assuming there are vast amounts of invisible dark matter, MOND theorists simply speculate that the laws of gravity are more complicated than Newton or Einstein assumed. Speaking of MOND versus dark matter, Siegel tells us that “Among cosmologists, there is no debate, because there is no alternative to dark matter that reproduces the observed successes.” This statement is false, and also clumsily enough contradicts the title of Siegel's post. There is indeed such a debate, and some cosmologists (such as those supporting MOND theories) don't believe in the dark matter theory. Siegel's untruth here is standard fare for ideological enforcers, who often take the tactic of exaggerating the popularity of whatever orthodoxy they are defending, while trying to sweep heretics and dissenters under the rug. What's most impressive is that the predictions of dark matter were first made in the 1970s and 1980s, and were observationally confirmed later. This is not a case of tweaking the model to fit the data; this is a case of the best kind of science you hope for: where you make predictions, make the observations, and what you see validates and confirms the predictions you had made. Such claims are rather amusing. Of course, the “best kind of science you can hope for” is when you directly observe something that you postulated before observing it (such as when Dirac predicted antimatter before it was discovered). But nothing like that has happened in regard to dark matter, which has never been directly observed, and which has no place in the Standard Model of Physics. As for predictions, theorists have been constantly fiddling with dark matter theoretical models over the past few decades to try to get them to fit observations, and there is still a large degree of discrepancy between observations and such models, particularly in regard to satellite galaxies. In his zeal to flog his ideological opponents, Siegel fervently tells us, “It's only if you ignore all of modern cosmology that the modified gravity alternative looks viable.” For a cosmologist to accuse other cosmologists of ignoring all of modern cosmology is an example of heated rhetorical excess that will not persuade anyone that Siegel is coolly and calmly pondering this weighty topic. 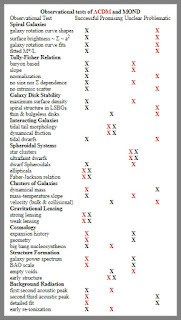 Below is a table found on the “Mond Pages” website defending MOND cosmology. The table compares the dark matter theory (shown in red) to the rival MOND theory. According to the author, the MOND theory actually holds up to observations better than the dark matter theory. The MOND theory seems better at predicting smaller scale reality (such as the situation around our galaxy and its satellites). 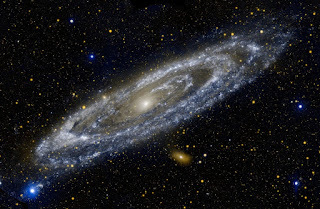 The dark matter theory works better only on the largest scales. In his post Siegel trumpets the better performance of dark matter theory on the largest scales, neglecting to tell his readers about all the many ways in which the MOND theory outperforms the dark matter theory, particular at smaller scales. 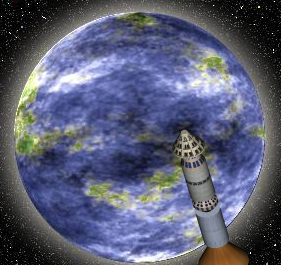 Siegel's claim of cheating is based on the flimsy complaint that the MOND theorists aren't being honest about how dark matter theory works better at the largest scale. 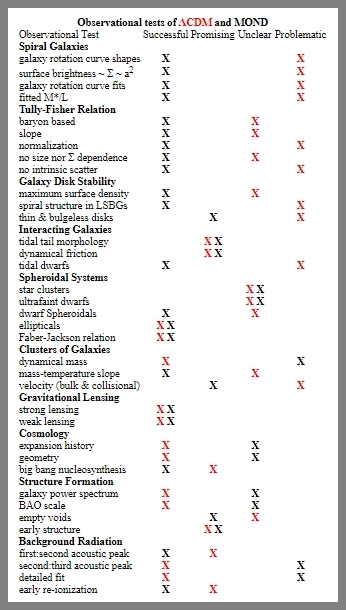 But, to the contrary, in the diagram above a MOND theorist seems to candidly admit that this is where dark matter theory does better (in the rows at the end of this table). No sign of any cheating going on here. The hard-core cosmologists are more convinced than ever that LCDM has to be right. It has obtained the status of a religion. Among astrophysicists who are paying attention but aren’t too deeply entwined with cosmology, there seems to be growing skepticism. But it depends on what they’re paying attention to. The closer you get to cosmology, the more it must be so. The further you get, the more absurd it sounds. In this post, the same person states that the search for dark matter has become a "quagmire of confirmation bias." If so, it isn't the only such quagmire on the landscape of science academia.